This popular article was updated on May 24th, 2017 to provide a more comprehensive introduction into an essential, modern tool. This is how we are welcomed when we visit the Symfony Console component tool page. The Symfony Console component tool provides us with a simple framework to create our own command line tools. Unlike many components in Symfony, this is a standalone package and is used by the likes of Laravel‘s Artisan and many other famous PHP packages. To read up on alternatives to Symfony Console, see our comparison post: PHP Console Wars! Essential information about Composer here. To create a new command, we need to make sure our file will be executable. In order to do that, let’s create a console file in the root of our project. This file will be our command manager. Now, let’s make sure the file is executable. Then, let’s make sure our file has the shebang at the beginning. The shebang is a character sequence (a number sign followed by an exclamation mark) that appears at the beginning of a script. When the shebang is present, exec() will instead run the executable specified after the shebang. In our case, it will run as a PHP script. Let’s take a closer look at things. First, we are autoloading all our dependencies, then importing the Application package from the Console component. After that, we are creating a new instance of the Application and running it. This is because we haven’t registered any commands yet, we only built the basic framework for them. Let’s create our script and register it in our newly created command manager. For this particular example, we will implement two simple commands: one for hashing strings, and another one for confirming a hash belongs to a given string. * Receives a string password and hashes it. It’s time to create our command. 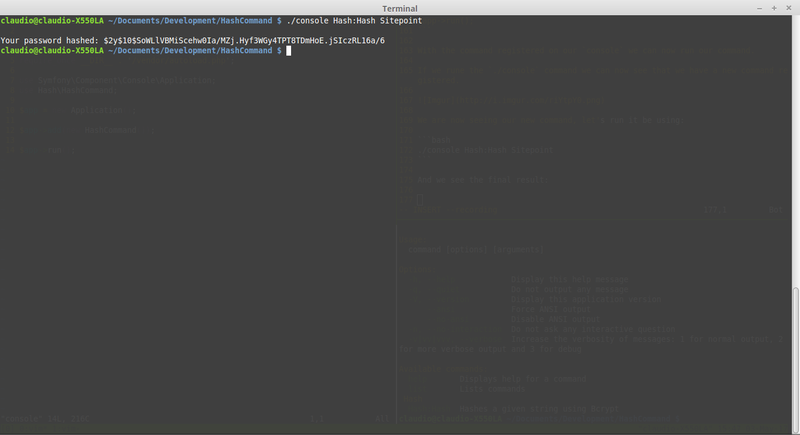 Let’s create a new PHP file called HashCommand.php. This class will extend from Symfony’s Command class and implement the configure and execute methods. These methods are essential for our command as they tell it how to look and behave. In the configure portion, the setName method is how we will be calling our command, setDescription is a description of our command, and addArgument is where we are saying that our command will take one argument called Password, and that it is required. In the execute portion, we are accessing the argument through the getArgument function, and then using our Hash class to hash it. Finally, we use the OutputInterface‘s writeln method to print our result to the screen. If we run our command like this, we will see that nothing happens. That’s because we are still missing one very important step. We still need to register our command in the console. With the command registered in our console, let’s run it. If we run the ./console command once again, we can see that we now have a new command registered. The hash is the result of running the PHP hash() method on the Sitepoint string. For the hash-confirming functionality, we will use the same method, but instead of one, we will have two arguments. One will be the string to confirm, and the other the hash we want to validate. We will be creating a new command file, right next to the HashCommand file. Let’s call it ConfirmCommand. Then, register the command in the console. When it comes to testing, Symfony provides us with some handy tools. 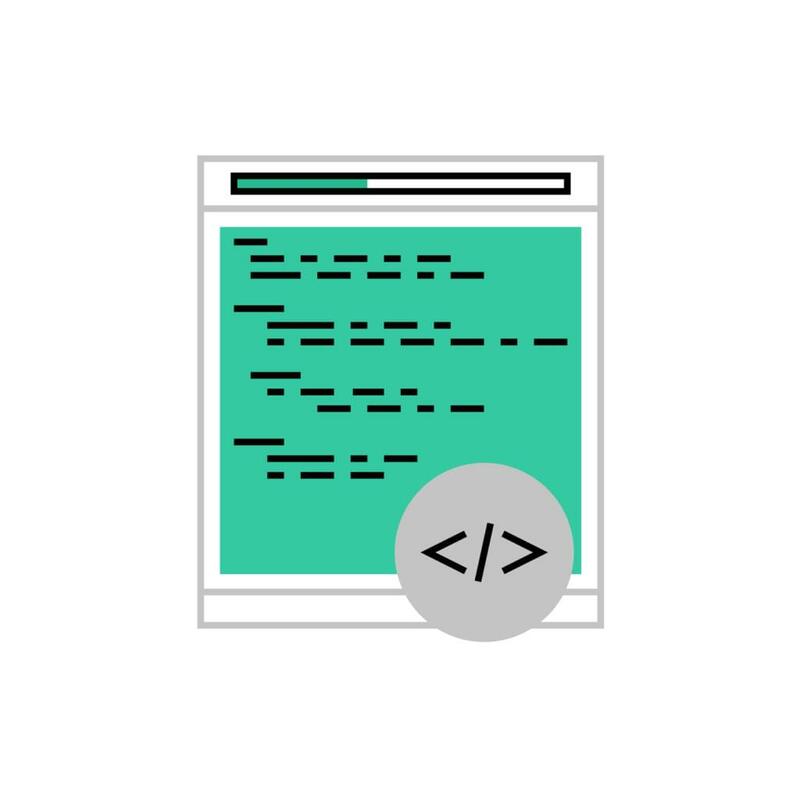 The most useful of them is the CommandTester class, as it provides special input and output classes to test our commands without the need of a command line. Let’s use the CommandTester class to implement a test for our Hash:Hash command. First, let’s create a /tests folder at the same level as our /src folder. We begin our test by loading our command using the Application class. Then, we instantiate a new CommandTester. With the CommandTester, we can configure how we want to call our command. The last step is just comparing the results of the execution with the result we are expecting using the getDisplay() method. 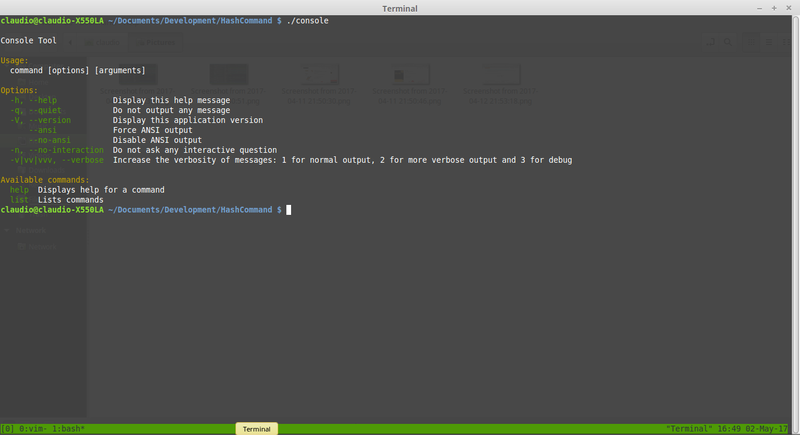 The getDisplay() method holds the result of our command’s execution, just as we would see it on the command line. 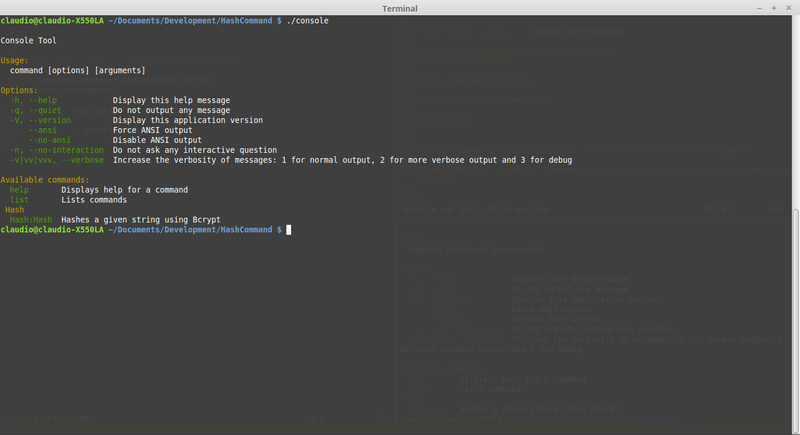 We just created two different commands using the Symfony Console Component. We also saw a good way of testing those commands. I recommend you take a look at the component’s various options and features, and give us some feedback on your experiments in the comments section below. Would you like to see some more advanced tutorials about Symfony Console on SitePoint? Let us know! All the code we wrote in this article is available on Github.